The IFP Puro incorporate a capillary membrane which reduces bacteria and parasites (i.e. Cryptosporidium, Giardia), and a fine sintered carbon pre-filter block to eliminate unpleasant chemical substances, as well as, unwanted taste and odours. The carbon pre-filter block also removes sediment and chlorine which extends the membrane life and so increases the life of the whole filter. 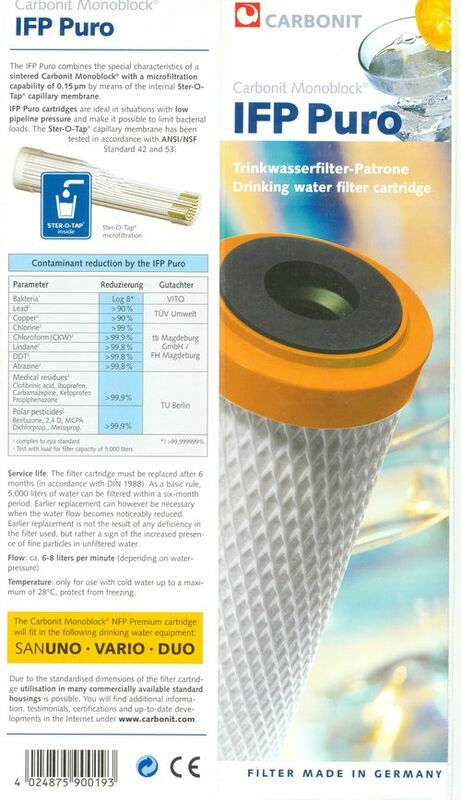 9 3/4" CARBONIT Monoblock IFP Puro (Dual Stage Pro): Sterile water (reduction of all bacteria) due to micro filtration cartridge (0.15 µm absolute, log 8 reduction) consisting of sintered carbon shell outside with Ster-O-Tap hydrophilic capillary micro filtration membranes in the inner core. The water flows from the outside through the carbon into the center and exits through the capillary membranes. Capacity of about 5000 liters. IFP Puro is a dual stage-filter cartridge (SOE) with minimal pressure requirements and an unparaled removal of micro-organisms i.e. bacteria, cysts and turbidity reduction (tested against ANSI/NSF Standard 53 and EPA Standard). Internationally patented. This dual-stage cartridge is able to handle demanding installations such as hospitals and healthcare locations. It also offers a higher flow compared to carbon block only cartridges. These CARBONIT cartridges fulfill the epdwa requirements of a one micron nominal performance and an expected change at least every six months. In fact the IFP Puro has a filter fineness of 0,15 µm (micron) absolute. Does not remove beneficial minerals. CARBONIT cartridges are in direct contact with the foodstuff water. An eleborate process of choosing our raw materials and of the production itself is necessary. Each carbon block is individually signed by laser mark to allow a close documentation of the whole cartridge life. The environmetally friendly concept of a filter cartridge in a high-pressure housing (drop-in filter) is always accompanied by a set of new gaskets and O-rings to ensure leakage-free filtration. And because we don't add any chemical substances (i.e. silver, heavy metal adsorbents) to it you know you are getting what nature intended – water as if from your own spring. At CARBONIT we like to keep it simple and environmentally friendly. We source the best raw materials, handle them with care and produce high quality cartridges and housings. To satisfy stringent European regulations and our own quality expectations.